CRIMANIMALZ STRIKE AGAIN!!! Bikes on the freeway…again…SORRRRRRY!!! HEEEEEEEEEERE WE GO! WOW!! OMG!! HOLY FFFFF! For the second time, in so many months, a group of Los Angeles bicyclists took to the freeway in protest of WHATEVER YOU WANT. The Crimanimalz Boarded I-10 at BUNDY and rode to the 405 FWY via the EXIT 35A ramp. 27 of them this time. This time, the riders joined freeway traffic which had only moments earlier passed under a huge (ginormous people) banner hanging over the fence at the 17th street overpass that read “RIDE A BIKE: YOU’D BE HOME BY NOW.” Whoever the bicycle gods sent to hang that sign are DEH MOTS, straight up APPLESAUCE. Thank you. Wow. I did not need that in my life right now. BoogalooShrimp, RichToTheIE and Cyper/Junkboat (uhh…Perry?) met with the Santa Monica Daily press and NPR the day before for not-so-exclusive interviews. Boogaloo and I hid from the Highway Patrol in a dark parking lot on Cotner and Olympic. We locked our bikes up to a water pipe, waited for our pulses to drop and then ran to Zankou where we hid out until the Heat subsided. It was the best ride I had ever been on. between 11th and 14th streets. 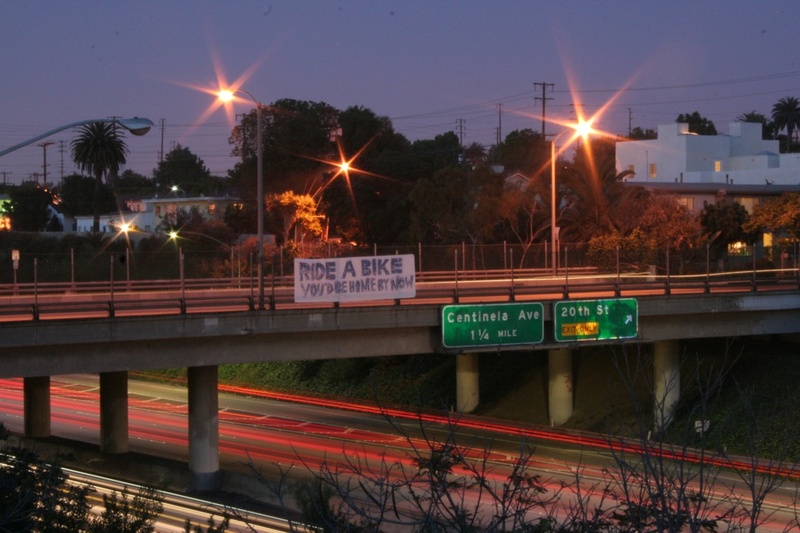 an activist group has begun mass bike-riding protests on Westside freeways. California’s car culture as unsustainable and polluting. the video shows bicyclists zipping past stalled sedans and semi-trucks. cars slowing and moving to the left on the two-lane transition ramp. posted by the name Boogaloo Shrimp. demonstration. Two riders were stopped, but not cited. eastbound 10 freeway at 14th Street in Santa Monica. cracked down on traffic violations in November and wrote 30 citations. interviewed by the Daily Press. appropriate, Markey told the paper. Legit videos to come. Stay tuned and watch the freeway.